Kira Willey serves up a baker's dozen of lovely, folksy, bouncy, friendly songs for dancing in the forest, jumping for joy, and tapping toes. These are tunes that give listeners many reasons to move! Willey carefully measures and paces the movement she inspires. Some songs, like "Go Plane Go" remind us that the journeys we take are as important as the destination. "Little Deer Isle" is an ode to a family's summer respite, and "Mama Nature" is an inquisitive appreciation for all things around us. Willey adds thirteen bonus tracks that are warm and easily manageable verbal introductions to yoga poses. RECOMMENDED! "Kira's voice is like warm honey, a cozy bed and sunshine all wrapped up together. When I got to ‘The Mixing Bowl’ my eyes teared up, my throat choked up and my heart warmed through and through. What a lovely song! I don’t know how you sing it without crying! I love that you have posture sequences for each song as well. This is exactly how I want my daughter to view the world and remember her childhood. Thank you for sharing it with us!" 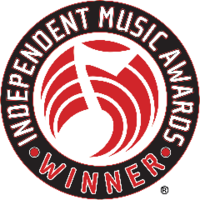 In the kindie music world, Kira Willey breaks through with her unique, two-in-one albums that blend upbeat, danceable music with get-up-and-move yoga inspiration. In October 2011, this innovative singer-songwriter from Bethlehem, Pennsylvania, released her second CD, "Kings & Queens of the Forest." The collection of 13 joyful folk/pop originals also features 13 bonus yoga tracks with Kira’s instructional voiceovers. Included in the album is a lyric booklet that guides parents with illustrations of Kira’s kid-friendly yoga routines. Kira's new album, "Kings & Queens of the Forest," has already won a 2012 Parents' Choice Award, as well as two songwriting awards: The Independent Music Award for Best Children's Song, and Third Place in the prestigious International Songwriting Competition--both for the leadoff track "Roller Coaster!" Produced by Zak Rizvi, "Kings & Queens of the Forest" keeps children captivated with its playful melodies and positive lyrics. Kids are the toughest crowd to please -- if they’re not engaged, they simply walk away. But Kira understands her audience well. Her warm, authentic songs, with themes of nature and the simple joys of childhood, connect instantly with children. When writing songs, Kira observes what fascinates her own kids. She often uses them as a sounding board by singing them a new melody, and then asking what it makes them think of. They dream up visions of friendly crickets and roller coasters; many of Kira’s songs were born this way. Kira’s pure, sweet, and soothing voice resonates with kids. Parents of special-needs children say they find their kids captivated by her songs, and preschool teachers, occupational therapists, and other youth workers regularly use Kira’s songs in their work. Her fun and easy-to-follow yoga instruction teaches self-awareness, improves balance and strength, and builds confidence. Kira grew up in a musical family - her brother sings the bass vocal on the track “Let the Sun Shine In” - and her passion for music began when she started to play the violin at age five. 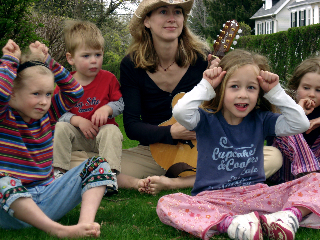 Initially she composed “grown-up” tunes, but after teaching kids’ music and yoga classes in New York City, she realized children’s songs were her calling. This was confirmed when Kira had her first child, began singing to her, and saw first-hand the bonding power of music. In 1996 Kira became certified to teach yoga to children and founded Fireflies Musical Yoga for Kids. A year later, she released her first album, "Dance for the Sun: Yoga Songs for Kids," which garnered many music-industry accolades, including the Independent Music Award for Best Children’s Album. In 2008, Dell featured her song “Colors” in a worldwide media campaign, which earned her fans around the globe. 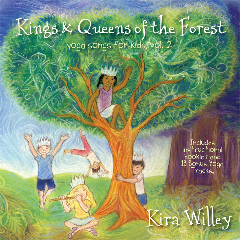 Kira’s new album, "Kings & Queens of the Forest," is available on iTunes, CDBaby.com, and her website www.firefliesyoga.com. In the upcoming months, she and her band will perform in eastern Pennsylvania and the New York City tri-state area. Kira is currently working on a lullaby album as well as a family music collection for future release.